OMEGA™ Model 70A Temperature Alarms are the latest development in solid state sound production. 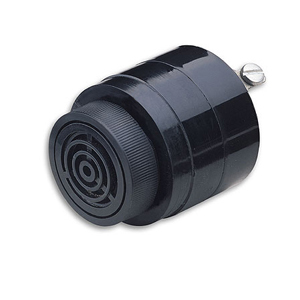 When power is applied, a piezoelectric transducer operates as a solid state oscillator resulting in a loud, audible alarm tone. OMEGA™ Temperature Alarms are designed to give years of trouble-free service. There is no arcing or mechanical wear, and they are rugged and easy to install. Only a 1 1/8" diameter hole is required for mounting by removing the front plastic nut, inserting unit and rethreading. Units are easy to operate. Simply connect to a temperature controller and 120 volt ac power supply. Model 70A Temperature Alarms will operate after having been subjected to 95% relative humidity at 40°C continuously for 100 hours. After removal from high humidity, the unit should be allowed to dry for a minimum of four hours at room temperature before operation. 注: To order with 220 Vac power, add suffix “-220V” to model number; no additional charge.